Charlene is a Project Officier who works for Notting Hill Housing – she is helping us upgrade our IT for care and support business. Charlene often wears brightly coloured clothes – which of course drew my attention to her. I asked her to tell me a bit more about herself. I like that people notice my outfits and comment positively on my style. I often wear two colours which complement each other in blocks. But I love patterns too. I am definitely an extrovert, and not at all scared of colour like so many people seem to be. I have colour confidence! But I also have a long standing interest in style, clothes and make up. I love those programmes – Ten years younger, How not to dress and How to look good naked – the make over just fascinates me. I think all women have a right to feel beautiful and I do what I can in terms of my own image, and as a beauty consultant where I help women to look their very best. When I am performing I like to wear false lashes, contact lenses, lots of brightly coloured make up. I just enjoy it so much! I enjoy working on projects – and in the future as personal projects I would like to design underwear, produce a cookbook and do more performing. I sing in the Nomad Bar in Old Street and at the bar at the Stratford Royal theatre – just an acoustic set. I usually wear a cocktail dress in a bright colour like lime green and pink. I also wear a lot of jewellery that I have from my Indian relatives – a bhindi and a full necklace, as you can see above. 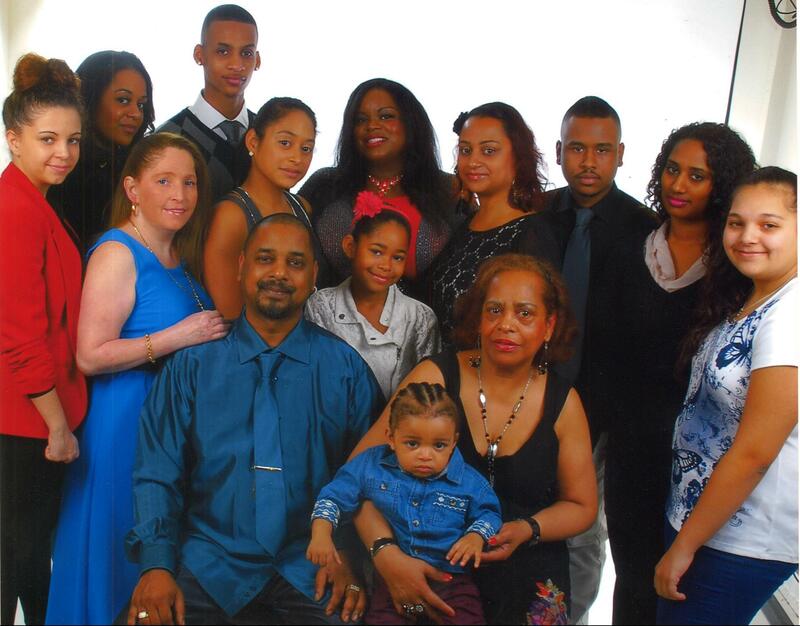 My family is Trinidian – my Grandma came from there and she brought me up. My family is quite mixed – with Spanish, Chinese, Indian and African ancestors. The clothes they wear in Trinidad are mainly the same as they wear here. But I have some Indian clothes as a result. I really enjoy wearing my turquoise sari. And I love belly dancing – wearing Turkish and other clothes with jingly coins on them. I have travelled a lot – to the Caribbean, the USA, Mexico, North Africa, within Europe. I thought the fashions and make up of North Africa was very inspiring – especially their dark eyes. I was the Carnival Queen at Notting Hill Carnival when I was 7. That is a real honour – you lead the float at Carnival, and you get to wear some of the best costumes. That is me right at the front in the navy, silver and white dress – here in Notting Hill. I am sure you know that Carnival was started and sustained by people from Trinidad – we have the same thing back home – it was great to express our identity, music and sense of art and style. My Uncle and other Trinidadians had a special band where they wore Native American costumes – they were famous in their time. For Carnival, and at other times you often see Trini people wearing the colours of our national flag with pride – it is red, black and white. We go strong on red – even the guys like to wear red trousers or jeans. I have always been a bit overweight. I used to diet in my teen years, but as I got older I just became more accepting of myself. To be honest I love food and dinning at nice places – I eat out alot and I enjoy myself. I am happy. I think I dress well for my size. You can get nice clothes in bigger sizes – I get quite alot from Ambrose Wilson which caters for larger ladies going up to size 32. Not everyone who is bigger wants to wear blanket tops! I would say to big women “Be fashionable – dress for your body shape not your size”. I have a curved, hourglass body shape so I wear softer fabrics, curved lines. I find an empire line is good, giving definition in the middle and making your legs looks longer. Wear something that skims rather than clings, and make sure it finishes below your wider parts. And smile – draw attention to your face. Its not just the clothes you wear that get you noticed you are beautiful lovely cheeful person. Its a joy to be in your company. Charlene – you are so beautiful, you definitely have colour confidence. The way you dress always brightens my day and I love seeing all the different colour you put together. Charlene has a pesonality as bright and joyful as the colours she wears. Thanks for sharing this article. You look gorgeous and are a great testament to the fact that beauty comes in all shapes and sizes. You go girl! Keep on brightening up this world with your vibrant colours. The colours you wear are lovely and have inspired me to experiment more with my colours. I also like your eye make up and would like learn to co-ordinate my eye make up too. What a wonderful post for a Monday morning. Charlene radiates beauty and positive energy. I love the colours and her philosophy. Great style Charlene. It is a great expression of your personality and heritage. And I never knew you sang! Let me know the next gig! Thank you for sharing your story. I’m fascinated by Trinidad and its unusual cultural heritage. Your last outfit is very inspiring: I’ll put those colours on my shopping list! Charlene, I love these pics of you! You look stunning in person and in pictures, and I really admire your confidence and sassiness – share some with me please! Thank you a thousand times for your comments ladies I really appreciate them. What a beautiful lady you are Charlene, I love how you put the colours together and wear them with confidence. You are an inspiration to all women. Well done and keep smiling ! Char you always look so lovely, I really admire your style, keep on inspiring us all to be more creative with our looks, and keep flashing the world that 1100kw smile . I wish every US teenager over 100 lbs. could see this posting and see how radiant you are; you are absolutely beautiful and glowing and accepting of what God has granted you. May you continue to be as blessed and giving as you are now. Thank you thank you thank you. You go girl! Charlene is such a wonderful person, her smile is brighter than the clothes she wears. She is such a blessing to others through all that she does. I’m glad everyone is inspired by her. She is a true inspiration! Great blog you look beautiful charl and have explained yourself exactly how you are outgoing happy colourful and lovely The pictures are brill expresses the trinidadian culture well. Charlene you look amazing as always. I admire your confidence and have always looked up to you. I’m very proud to have such a amazing loving positive person like you around. I was given this article to read by a fellow colleague. You’re an inspirational vibrant outgoing woman. I love your honesty about your size as I have found many people seem to think that plus sizes don’t know how to dress and are not happy with their size. The confidence you exude brought a smile to my face. Keep on shining Charlene Peters, keep on shining.